Sunday, October 18th, I talked about what inspired me to write Things Unsaid and read some excerpts from my book. This is a wonderful indie bookstore and the owner and staff were so enthusiastic and supportive! LOVE, LOVE Folio bookstore and all of the thoughtful readers who listened to my very first reading at a bookstore. They asked great questions Thank you all from the bottom of my heart! On Sunday, October 4, I was invited to a book signing at the annual Carmel Highlands Arts & Crafts show. Wonderful food, wine, and friends gathered at a beautiful home of a neighbor to display their arts and crafts. Thank you to all in my neighborhood for the celebration of our community. 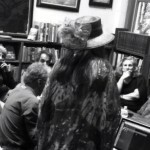 On Tuesday June 9th, Old Capitol Books featured Diana Y. Paul, author of Things Unsaid at NETWORKING ALOUD: A WRITERS OPEN MIKE, a free monthly event open to the public every second Tuesday, in Monterey, California. For more information, visit Old Books Capitol.